The changing climate requires that plants and animals move in order to survive. Therefore, the demand that historical ranges of native plants and animals be restored and maintained is both unrealistic and harmful. It is unrealistic because the environment has changed in the past 250 years since the arrival of Europeans on the West Coast and it will continue to change. Therefore, we cannot assume that the native plants that existed here in 1769 are still capable of surviving here. It is harmful because animals can and do move as the climate changes. Therefore, eradicating the plants they need for survival is harmful to them. The eradication of non-native plants and trees is exacerbating climate change by releasing their stored carbon into the atmosphere, thereby contributing to the greenhouse gases that cause climate change. When prescribed burns are used to eradicate non-native plants or prevent natural succession the release of carbon into the atmosphere by the plants that are burned is immediate. When large, mature trees are destroyed, the carbon they have stored as they grew is released into the atmosphere as the wood decays. Furthermore, their ability to store carbon in the future is lost to us going forward. Since carbon storage is directly proportional to biomass, whatever we plant in their place is incapable of storing as much carbon as the mature trees. There is an important caveat that we must add to our first bullet point. Changing location is not the only mechanism that can ensure species survival in a changing climate. Many species are probably “pre-adapted” to the changed climate. That is, they may be capable of surviving changes in the climate. Secondly, species can adapt and/or evolve in response to changes in the environment, which is another mechanism that facilitates species survival. We invite our readers to visit our post about the rapid evolution of finches in the Galopagos Islands in response to extreme weather conditions that caused selection events. Today we will inform our readers of the scientific record regarding the need for plants and animals to move as the climate changes. We will use the recently released fifth report of the Intergovernmental Panel on Climate Change as our source. First we will establish the credibility of the Intergovernmental Panel on Climate Change (IPCC). The IPCC was formed in 1988 by the United Nations. It is composed of thousands of scientists from all over the world, representing the 190 member nations of the UN. The IPCC does not conduct original research. Rather it compiles thousands of peer-reviewed scientific studies into reports that represent a consensus viewpoint of the global scientific community. Typically, scientists from 120 countries participate in marathon sessions in which consensus must be reached before reports can be published. 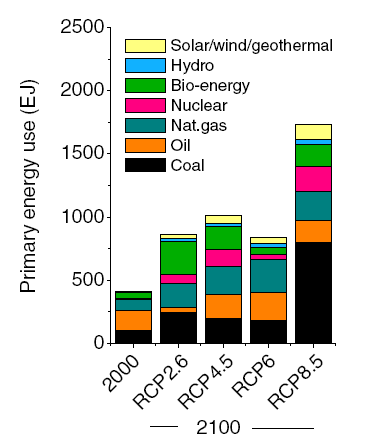 The IPCC has published 5 reports since 1988, the most recent earlier in 2014. 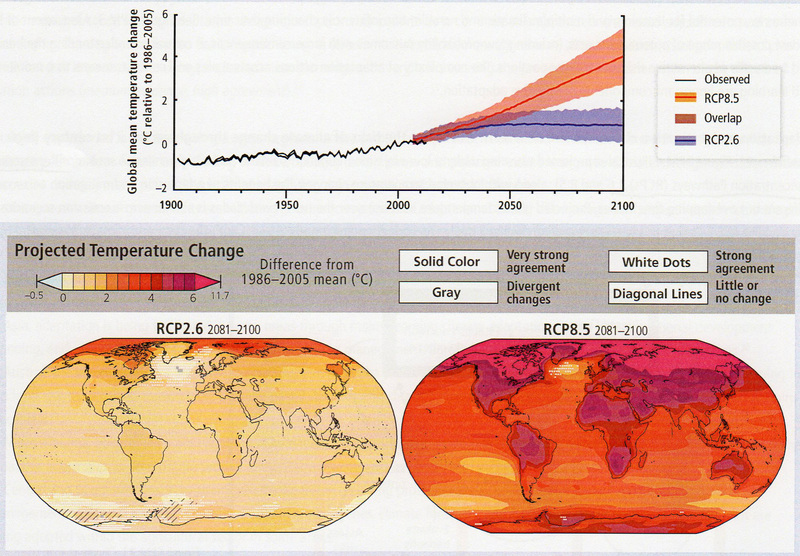 The IPCC compiled several different sources of data to report how the climate has changed from 1900 to the present. Then they modeled the multitude of variables that influence climate to predict different trajectories for the climate going forward to 2100. The many variables that influence climate interact in complex ways that are not entirely predictable. There is therefore some uncertainty in those predictions, as there is in any prediction of the future. Therefore, future temperature is depicted by the following graph as “bands” of probability. The bands become wider as the graph depicts further into the future, as we would expect; that is, the distant future is less predictable than the near future. The graph reports that the average global temperature has increased by 1° Celsius (1.8° Fahrenheit) from 1900 to the present. Graphs depicting the more distant past indicate that the climate began to warm around the time of the industrial revolution, about 1850. Therefore the total increase in temperature is greater than that depicted by this graph. However, the rate of increase has accelerated greatly in the past 50 years. The upper range of projected temperature increases on the graph is labeled RCP8.5 (Representative Concentration Pathway 8.5). That pathway is based on the assumption that present levels of greenhouse gas emissions will continue to increase at the same rate as they have in the recent past. The mean prediction of that pathway is a global temperature increase from the present to the end of the century of 3.7° Celsius (4.6° Fahrenheit). The world has done little to reduce greenhouse gas emissions and America has done even less. According to a recent Gallup Poll, only 39% of Americans are “concerned believers” in climate change. Another 36% of Americans believe the climate is changing, but don’t believe it will affect them. Twenty-five percent (25%) of Americans do not believe the climate is changing. Therefore, for the time being, it seems extremely unlikely that our polarized politics in America will be capable of responding effectively to the grim reality of climate change. Within that context, we inform you of the final graph from the IPCC report about the need for plants and animals to move from their present ranges in response to climate change and their variable ability to do so. 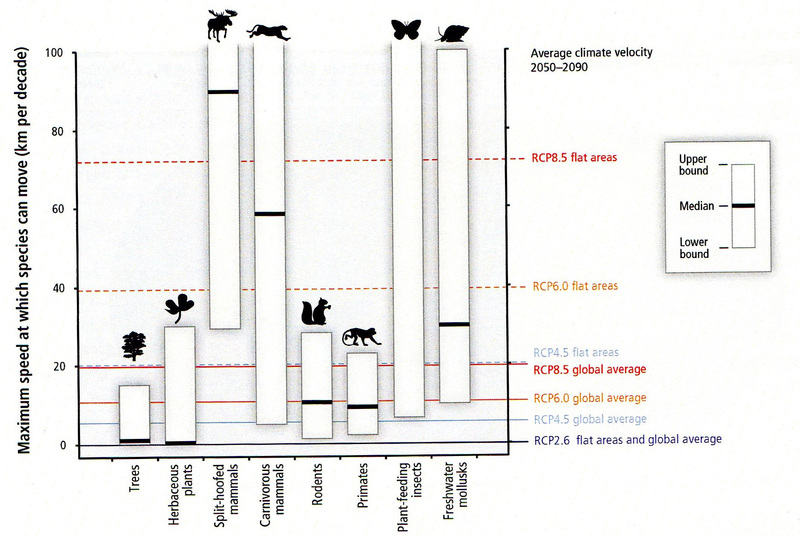 On the vertical axis, the graph depicts the ability of plants and animals to move, measured in kilometers per decade. The horizontal lines depict the need of plants and animals to move in response to various scenarios of climate change as we described earlier. The bars depict the ability of plants and animals to move and the height of each bar informs us of the variable ability of plants and animals to move. Trees are the least able to move, unless we have the wisdom to plant them outside their native ranges—at higher latitudes or elevations–where they are more likely to survive in the future. For example, if we radically reduce greenhouse gas emissions immediately (RCP2.6), most species of trees and plants will be sustainable at their present latitudes and elevations. But if greenhouse gas emissions continue on their current trajectory (RCP8.5), most species of trees and plants will not be capable of moving far enough, fast enough to survive as the climate warms. Although trees and plants are capable of moving only very slowly, most animals are capable of moving more rapidly. Will they have the plants they need to survive in their new ranges? Surely there aren’t many native plant advocates in the San Francisco Bay Area who don’t believe in the reality of climate change. The Gallup Poll reports that most people who don’t believe in climate change are Republicans and in the San Francisco Bay Area Republicans are a small minority. And so we ask native plant advocates this question: How do you reconcile the reality of climate change with your demand that native plants be restored and maintained where they existed 250 years ago in a very different climate? This is a straw dog argument. The non-native invasives we fight in the USA are not natives whose locations have shifted due to climate change, but exotic invasives introduced from overseas. Climate change would not bring Amur Honeysuckle to North America from Asia. Sheesh. GW has apparently misinterpreted our post. In the event that other readers have made the same mistake, we provide this clarification. Most plants considered “invasive” by native plant advocates were introduced by humans, both intentionally and unintentionally, as GW says. Our post is not claiming otherwise. Rather this post refers to the fact that plants considered “native” by native plant advocates have changed their ranges (or otherwise adapted) in response to climate change and that since further climate change is inevitable, plants must continue to move or adapt in order to survive. Climate change requires a rethinking of the word “native.” The reality is that attempts to “restore” a landscape to a pre-Columbian ideal are unsustainable. Straw dog (or straw man) argument? gw provides a perfect example. gw argues that “non-native invasive” plants didn’t migrate to North America in response to climate change. Well, duh! The Milliontrees article didn’t say, or imply, any such thing. So either 1) gw didn’t understand what he was reading, or 2) gw falsely attributed to Milliontrees a statement that Milliontrees never made (setting up the straw dog.) Either way, Sheesh. The author uses climate change to buttress the website’s unsupportable premises, leading readers to think biologists address native habitats affected by climate change and habitats invaded by foreign invasive species as one and the same. This is not true. Biologists study the effects of climate change on a per species basis, and not one I know of would advocate wipeouts of native species on the move to survive. Nor is anyone here advocating “wipeouts of native species.” Climate change will accomplish that and native plant advocates are accelerating that process by inadvertently contributing to climate change. Once again, GW misinterprets our message. Straw Dog Alert! Straw Dog Alert. No one on this website, neither author nor commenter, has said anything remotely like that. gw can’t expect people to take him seriously when he makes up such outrageous stuff. I agree, Millon Trees. Plus, David Theodoropoulos’ work is a brilliant reminder that native is relative. Gingkos once lived in the Americas, as did mammoths and mastodons. Redwood family were once native to Europe and the Metasequoia Glyptostroboides (Dawn Redwood), now only “native” to a small part of China once was here too. But the fanatical nativists would have us kill these trees, as well as those who are not far from their original habitat, like the magnificent Monterey Cypress and Monterey Pine. Those who want no “non-native” plants here should leave if they themselves are not Native Americans. They should also stop being hypocritical by supporting those who breed non-native plants when they buy fruits and vegetables since none of the produce people eat are native. Seriously. They only want to deprive the native animals of their food and homes, but keep non-native agriculture going for themselves. Webmaster: Nor have we said that “biologists want to deprive native animals of their food and homes.” First, one must make the necessary distinction between “biologists” and “native plant advocates.” These are two distinctly different groups of people. GW is apparently a native plant advocate, not a biologist, by his or her own description. Although there are still many invasion biologists, there are a growing number of biologists whose empirical studies have overturned the hypotheses of invasion biology such as “ecological balance.” Many of those studies are reported on this blog. Secondly, neither group of people WANTS “to deprive native animals of their food and homes.” Unfortunately, some of the projects in which they are engaged are unintentionally doing so because the reality is that animals ARE using non-native plants and trees. This is a fact that is well-established by scientific, empirical studies of which GW is apparently unaware. The “truth” is established by empirical studies rather than by the decrees of native plant advocates. Evolution did not stop in 1492. It is an on-going process that is happening constantly in response to every change in the environment, including changes in vegetation. Equal numbers of insects are found in introduced vegetation and some insects are known to have already evolved in response to new vegetation. When “monocultures” are created by introduced plants, they are most often caused by anthropogenic changes in the environment: increased levels of carbon dioxide, nitrogen in the soil, reduced precipitation, changes in the climate, etc. When non-native plants are destroyed, native plants are rarely able to survive in the changed conditions unless they are irrigated and intensively weeded. Without such intensive gardening, non-natives quickly return because they are better adapted to current conditions. Biodiversity is species richness that supports the greatest number of native animals. This is nothing more than Field Biology or Ecology .101, so it is difficult to understand this website except that apparently some people really like some non-native invasives and will throw any argument they can think of at the issue to support their opinion, including desperate insults and attacks that bear no relevance. Webmaster: GW’s definition of “biodiversity” is a reflection of his or her opinion. Arthur M. Shapiro, Distinguished Professor of Evolution and Ecology at UC Davis, has provided us with another definition of biodiversity: https://milliontrees.me/2014/04/15/what-is-biodiversity/ No scientific measure of biodiversity makes a distinction between native and non-native. We are sorry that GW feels “insulted.” It is not our intention to insult. Rather we are trying to inform. In doing so, we make few statements that are not supported by scientific studies. In the case of this particular post, GW is actually arguing with the Intergovernmental Panel on Climate Change, composed of thousands of scientists from all over the world, not with us. Webmaster: We posted this comment and our replies to it before we realized that the comment was addressed to Bev Jo. Our apologies for our mistake. 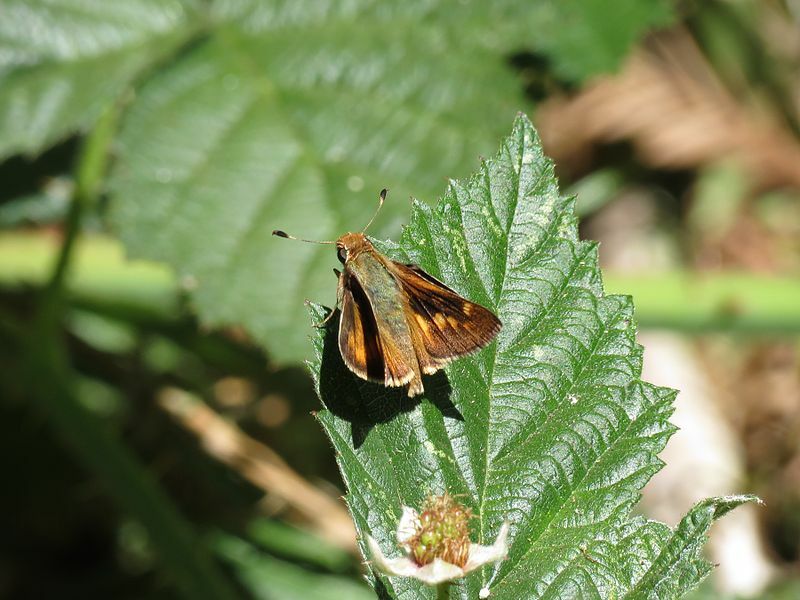 This website is full of scientific citations establishing that E. globulus is well integrated into, and plays a large role in the ecological communities where it lives in California. gw provides no evidence whatsoever to indicate we should reject the scientists’ findings. Further, a biologist can’t tell by examining a plant in its wild habitat whether it evolved there or has integrated after migration or introduction from elsewhere. The biologist must know its history to know whether to call the plant “native” or “non-native.” The ecological processes are the same. Perhaps gw could provide a scientific reference that uses his garbled definition of “biodiversity.” Even a reference to an Ecology 101 text? Second, neither “species diversity” not “species richness” includes a distinction between “native” and “non-native” species. If you define biodiversity as native species only, you step outside of science and into ideology. Then a statement like “Non-native plants contribute nothing to biodiversity” becomes automatically true, a tautology (logical or British usage), but devoid of any scientific meaning. It doesn’t matter what scientists find in the field; the statement isn’t subject to evidence (as scientific statements are).